More than a decade after civil society across the globe mobilized to end mass atrocities in Darfur, reports of mass rapes and killings continue to trickle out of western Sudan. In today’s blog post, AIPR guest blogger Dominique Fraser, who most recently analyzed the conflict in CAR, scrutinizes the impact of UNAMID, the African Union – United Nations Hybrid Operation in Darfur, for its failure to provide sustainable peace and security for Darfuris. As with all AIPR Blog posts, the personal opinions of the author do not reflect the views of AIPR. The current Darfur crisis began over ten years ago and soon gained international attention with civil society groups and celebrities like George Clooney trying to push the crisis to the top of the agenda of Western policy makers. Now Darfur is again in the news. On 6 November, the Guardian published an article detailing how the Sudanese government prevented the UN-AU peacekeeping mission UNAMID from reaching a town in North Darfur, where 200 women and girls had allegedly been raped. Only a week earlier, in an article by Foreign Policy, readers learned that an internal UN probe found that UNAMID had withheld evidence detailing culpability of Sudanese armed forces and their proxies in committing crimes against civilians and peacekeepers. Such reports, although shocking, do not surprise those who have followed the crisis closely. The mission was set up as a compromise between the UN and Sudan. It was therefore quite predictable that the mission would not be able to function without impediments by the Sudanese government and that UNAMID would need to spend considerable time and effort to gain the cooperation of the government. After the outbreak of violence in early 2003, the international community was initially quite apathetic in its response. This was despite the U.S. terming the crisis a “genocide” in September 2004 and UN findings that serious crimes against humanity were being committed by government militia, the janjaweed. 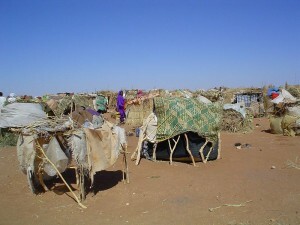 However, the permanent members of the UN Security Council had little interest in getting involved: while the U.S. and UK were preoccupied with the peace talks between North and South Sudan and the internationally unpopular invasion of Iraq, Russia and China were more interested in protecting their weapons and oil investments in Sudan than stopping the rapes and killings in Darfur. As a result, the newly created African Union took the lead and established a peacekeeping mission (AMIS), but without the express objective to protect civilians. Despite an initial reduction of violence after the deployment of AMIS, the mission was soon seen as a failure due to severe financial and resource restraints. Over three years after the outbreak of violence, the UN Security Council adopted Resolution 1706 on 31 August 2006, which ‘invited’ Khartoum’s consent to extend the mandate of the UN peacekeeping mission in Sudan (UNMIS) to Darfur, which would mean a transition from the AU to a UN peacekeeping operation. The government of Sudan, however, was worried about its ability to silence dissent in its Darfur region, at a time when it was losing control over the South. Consequently, Sudan never consented to a transition and the idea of UN peacekeeping in Darfur died. Almost exactly a year after Resolution 1706, the UN Security Council authorized a UN-AU hybrid mission in Darfur, the first of its kind. This hybrid mission was very much a compromise between the UN and Sudan. The Sudanese government perceived this mission, with a predominantly ‘African character’, to be less able to carry out a mandate to protect the civilian population. Additionally, China – despite its efforts to get Khartoum to agree to such a mission – continued to shield it from sanctions should the government not cooperate with UNAMID. Such wrangling has meant that UNAMID has, ever since its creation, been more concerned with galvanizing support from the government, rather than with protecting civilians. While it is therefore deplorable that UNAMID has failed to hold the government of Sudan to account and UN Secretary General Ban Ki-moon is right to be “deeply troubled”, this outcome is nonetheless unsurprising and is owing to the unique circumstances under which this first-ever hybrid mission was created. This entry was posted in Guest Preventer and tagged Darfur, Save Darfur, UNAMID on November 11, 2014 by admin.